After reading too many cliché blog posts about blistering heat in Central America, I vowed not to start this one by describing waves of humidity, beads of sweat or any other form of meteorologically-induced moisture as I stepped off the plane in Tegucigalpa. 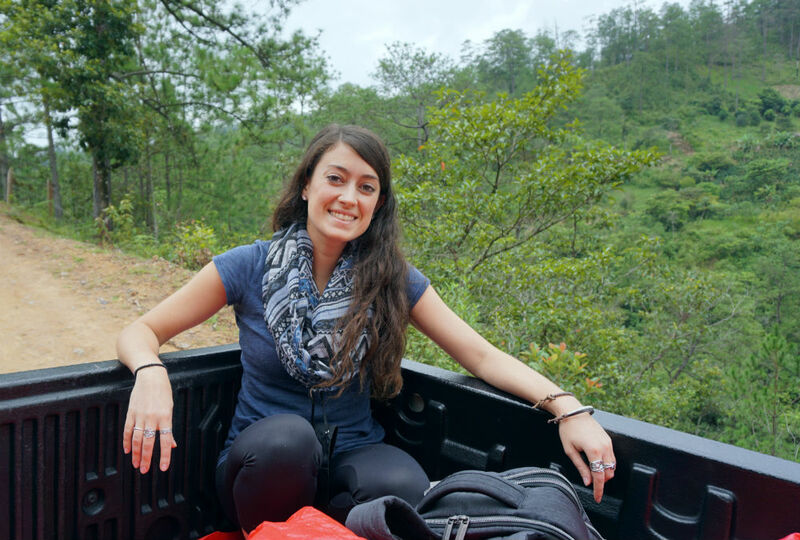 A five-day reporting trip in Honduras. Instead, I’ll start with me, wandering around the Honduran capital wearing an unseasonably warm denim jacket and the most intimidating facial expression one can muster after 24 hours without any sleep. (The irony of the first paragraph is not lost on me). 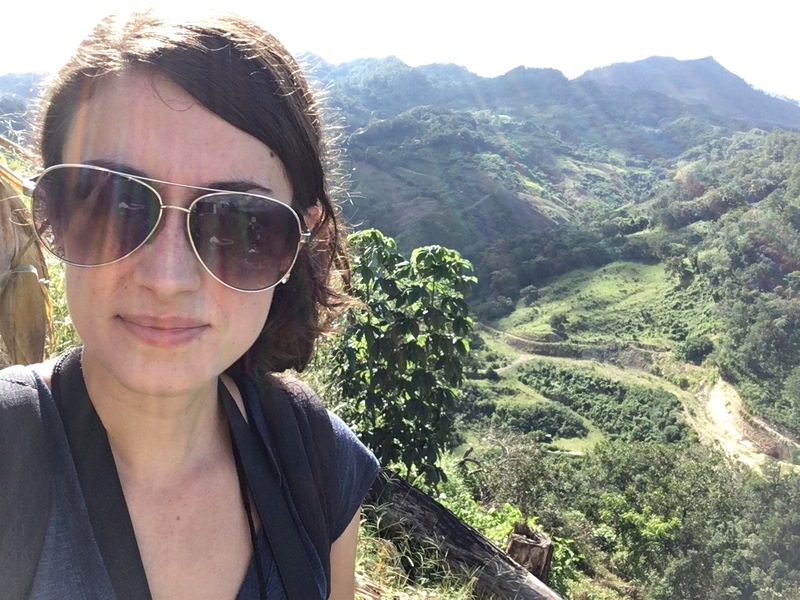 I arrived in Honduras on Oct. 19, 2017 with a bright green, 50-litre knapsack strapped to my waist and a worthy head of airplane hair following transfers in Toronto and San Salvador. It was a last-minute work trip, and I had only enough prep time to dig up the following facts about Honduras: its government is notoriously corrupt, held captive by organized crime and clandestine power groups; its capital city has claimed the world’s highest murder rates; and it’s one of the deadliest and most dangerous places to be an activist, journalist or woman. On my way to report from Indigenous Lenca territory in Río Blanco, Honduras. I, naturally, was at least two of the last three, and there to investigate human rights abuses tied to state corruption and international corporate energy interests. I pored over statistics from my hotel room: one woman murdered every 16 hours. More than one environmental activist murdered every month. Unconfirmed rates of incarceration for reporters, and at least 69 dead since 2001. It’s unfortunate this negativity dominates online literature about Honduras, a truly beautiful country whose spirited people have much more to offer than crime stats. Nevertheless, I put my guard up in Tegucigalpa, at least in the beginning — a vigilance manifested in a tough jean jacket and don’t-mess-with-me-face mastered long ago in Kenya. In about a day, I would link up with an inspiring cohort of women activists, philanthropists and Nobel Peace Prize laureates from around the world, but until then, the aviators were on, the hair was tied back and the reporting equipment was safely stowed from public view. 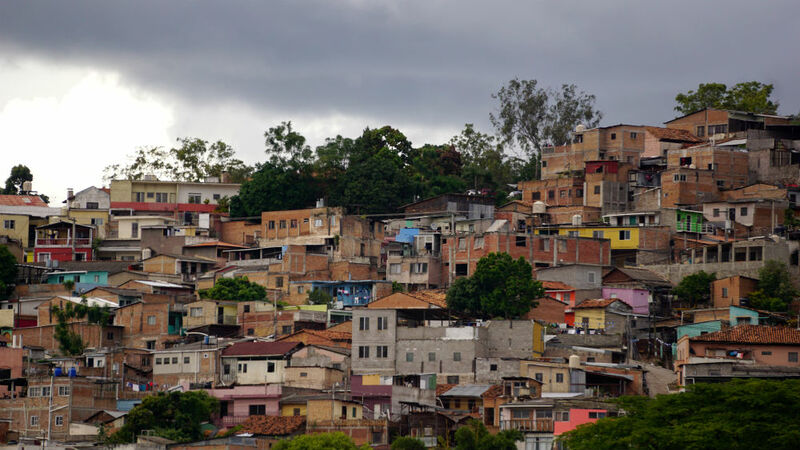 Hillside settlements in Tegucigalpa, visible from the Hotel Honduras Maya. It was the beginning of a Central American adventure that after two, marvellous weeks of reporting, would send me bouncing off a rooftop trampoline at midnight in Guatemala, hitchhiking to the surf in El Salvador, and sledding down a volcano in Nicaragua. Below, you’ll find an account of my experience as a journalist in Honduras, along with a few useful tips, should you choose to travel there. If you walk around Tegucigalpa, be prepared to feel the burn. This stunning, highland city is surrounded by lush green mountains, and its roads are steeper than any I’ve seen — and I’ve been to San Francisco. The commute is aggravated by a lack of urban planning, which has more than 400,000 people battling gridlock in cars, tuk tuks, on bikes and on foot, in temperatures that sometimes exceeds 30°C. A bird’s eye view of Tegucigalpa in October 2017. The city is divided by the Choluteca River, which separates it from its sister city of Comayagüela. Brightly-painted houses, metal sheet shelters and gated complexes with flowering creepers are among its residential establishments, divided by neighbourhood wealth. In the downtown core, you can lose yourself in plazas, shopping centres and restaurants if your pockets are deep, but for many of Téguz’s 1.2 million residents, who live in informal settlements, such swanky pitstops are out of reach. I walked around a part of town called Colonia Palmira, where omnipresent gun-toting guards provide some illusion of safety. This is where many of the city’s embassies are located, and here, I found glorious signs of political resistance wedged between billboard ads for Pizza Hut, Forever 21 and McDonald’s new Jolly Rancher McFlurry (evidently, a marketable flavour in Honduras). Contraceptives graffitied to brick walls promoted reproductive rights against a total government ban on abortion, while spray-painted superheroes endorsed anti-corruption activism. 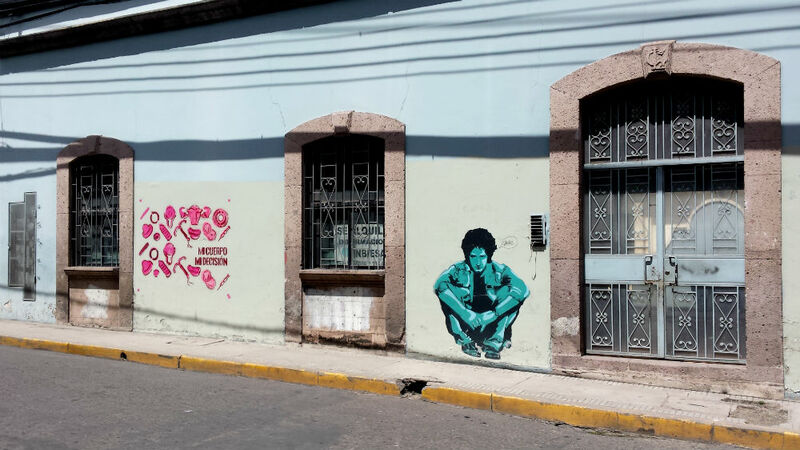 Elsewhere in the city, murals paid tribute to beloved Berta Cáceres, a murdered Indigenous activist whom the Honduran government failed to protect. All signs pointed toward an Indigenous and feminist uprising that is shaking traditional systems of power — a movement I chronicled for the National Observer. 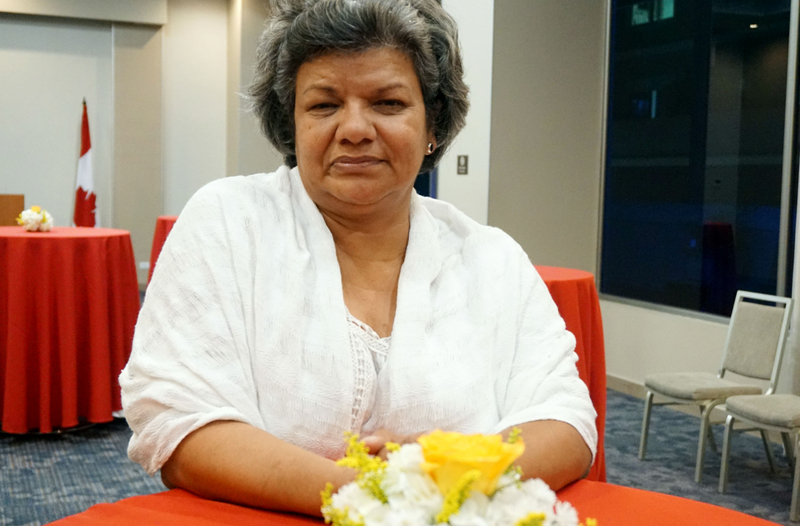 READ: Women in Honduras are leading a rights revolution. How many lives will it cost them? 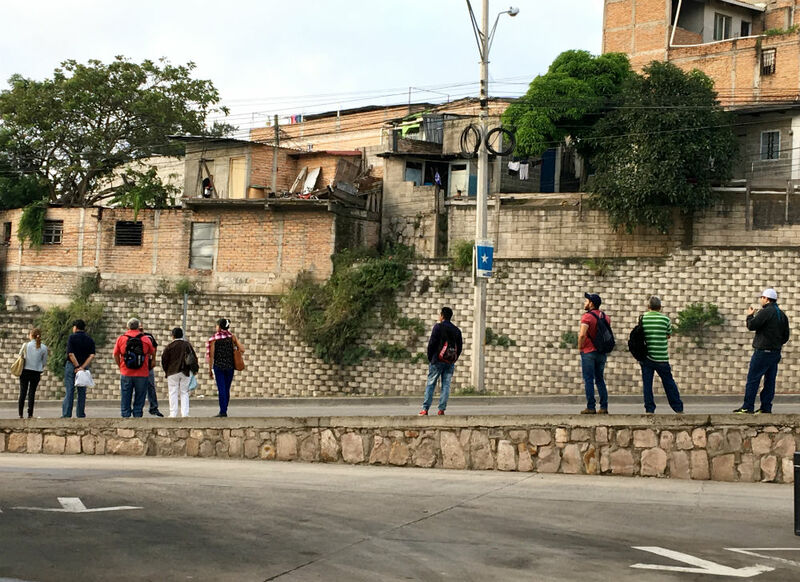 Commuters wait for the bus at 6 a.m. on the outskirts of Tegucigalpa. With a passion fruit smoothie in hand (69 Lempiras from a nearby café), I continued my march into residential Téguz. The public buses had cartoonish melodies for horns, which they happily used on squeegee boys forcing their service on unwilling customers, while street performers, including clowns and jugglers, tailed uniformed students buying sweeties from chip, fruit and flower stands. It certainly didn’t seem like a city whose murder rate is among the highest in the world, but few cities reveal their true character — for better or worse — after just half a day’s walk. In short, be cautious in Tegucigalpa, but don’t make sweeping assumptions about the city or its people based on violence detailed online. I know women who live here, walk to work here, and love their lives in the Honduran capital. But as a first-time visitor, however, I’d stick to the beaten path. Later that evening, I met the women with whom I’d be travelling: a jaw-dropping assembly of international feminist, peace and democracy powerhouses, led by Nobel Peace Prize laureates Tawakkol Karman of Yemen and Shirin Ebadi of Iran. 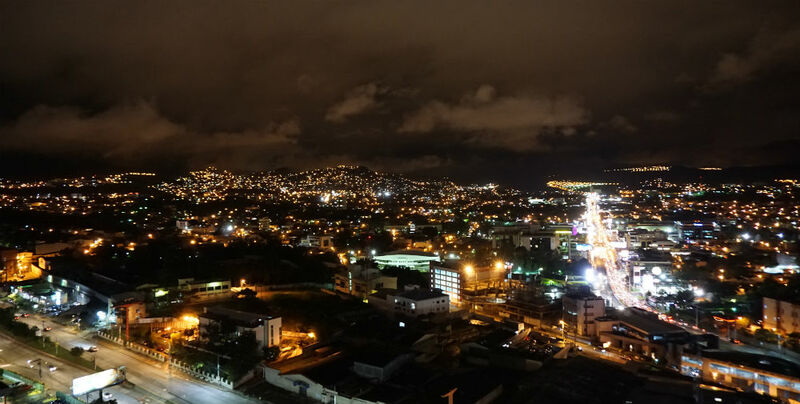 Tegucigalpa at night from the terrace at Piso 24. 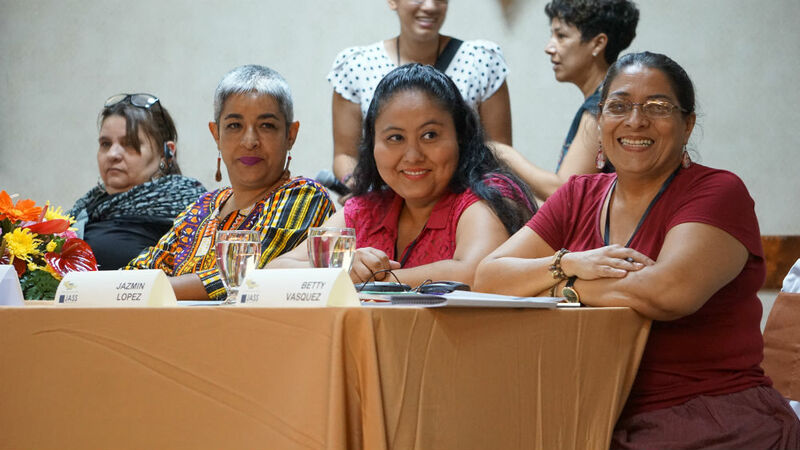 They were in Honduras to bear witness to injustice, and use their prominence to amplify the voices of local women human rights defenders. Read more about the Nobel Women’s Initiative here. 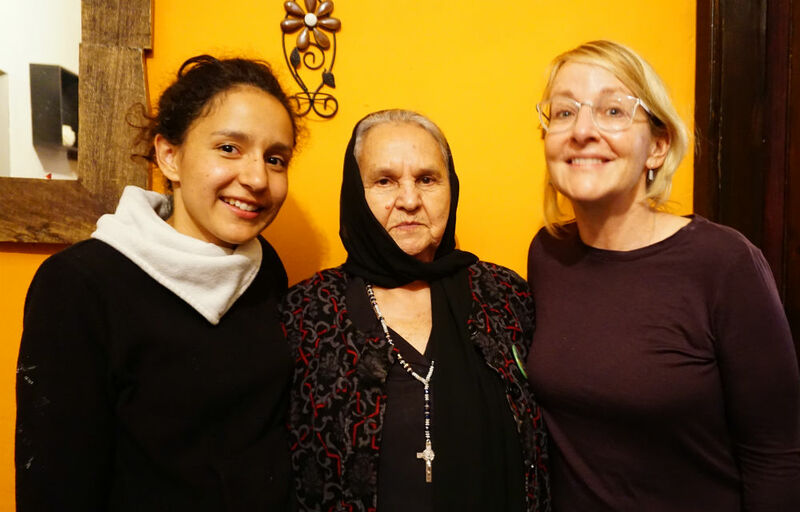 We were told over dinner by local activists that Honduras has been “kidnapped by its political system,” and is the most unequal Latin American country for women after Haiti. “The history of Honduras, unfortunately, could be the same as a tear,” said Daysi Flores of Just Associates MesoAmerica, revealing that 98 per cent of murder cases involving women are never investigated. We were saddened and angered, but not surprised, and glad we were there to offer our emotional, spiritual and professional support. I would later learn that our inaugural meeting coincided with K’at, the spider, on the Mayan calendar — a day for solving problems, undoing the knots of life, making friends and forming new unions in a group. It would not be the last time the Mayan calendar surprised us during our time in Central America. 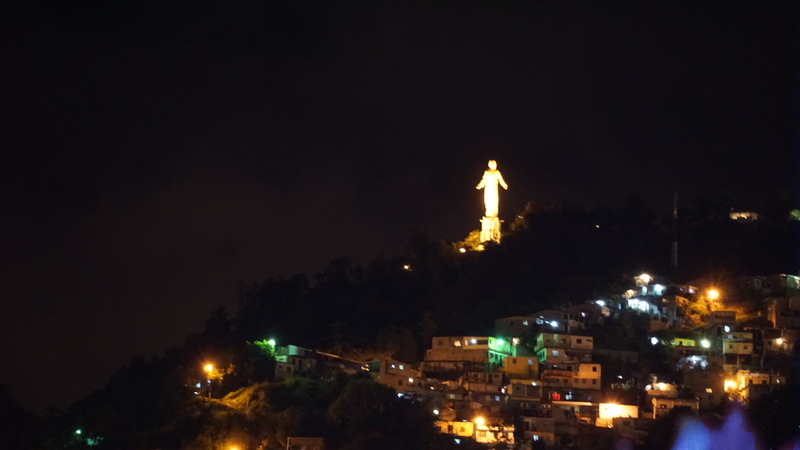 Tegucigalpa wakes up around 5 a.m., which is when our jet-lagged delegation shuffled blearily onto a bus bound for Río Blanco, roughly four hours by road in the Department of Intibucá. As the sun peeked over the mountains, dumpster divers were already at work on the outskirts of town, while commuters waited for buses heading to the core. A few joggers even braved the cool morning air — air that had me hiding, once again, in my tough denim jacket. The scenery shifts dramatically from Tegucigalpa to Intibucá. 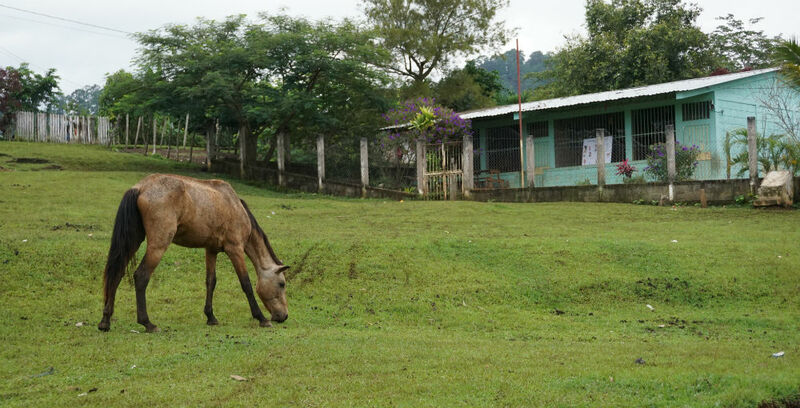 The winding road out of Téguz provides a more complete picture of life in Honduras than its steeper counterparts in the city. After passing a waterpark, Chinese villa, U.S. military base, and Wendy’s Restaurant in the middle of nowhere, our landscape shifted to one of auto junk yards, maize and coffee plantations with an unending backdrop of bright green hillside. 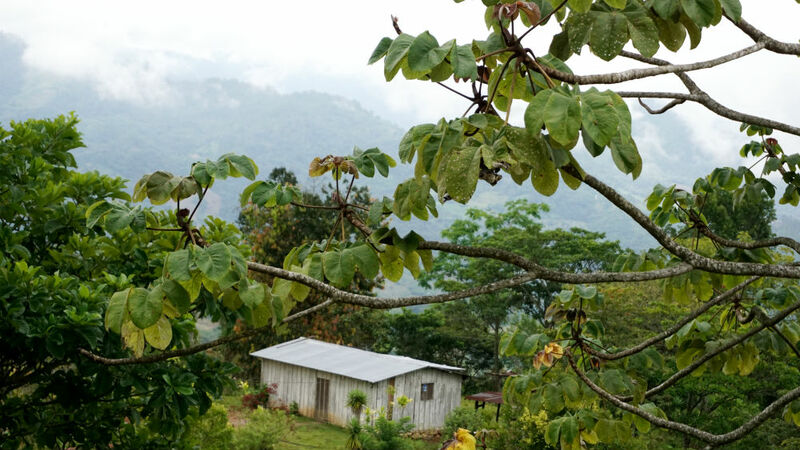 We pulled over twice before reaching our final destination — first, to be informed that we were in Indigenous Lenca territory, and second, because our bus would soon become stuck in the mud if it continued its uphill drive. We split into smaller groups and I hopped in the back of the nearest truck. 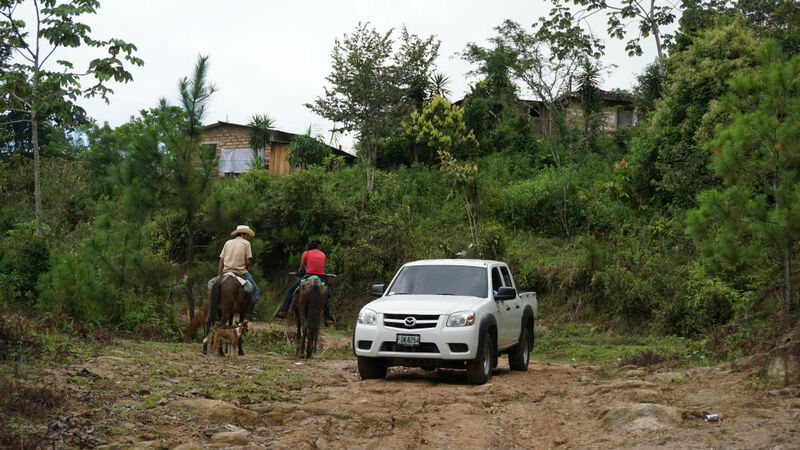 We were on our way to the Gualcarque River — the sacred lifeblood of the Lenca people, and the river that award-winning environmentalist Berta Cáceres died to protect from a Honduran hydro company. For more information on her murder and the people behind it, read this jaw-dropping New York Times investigation. 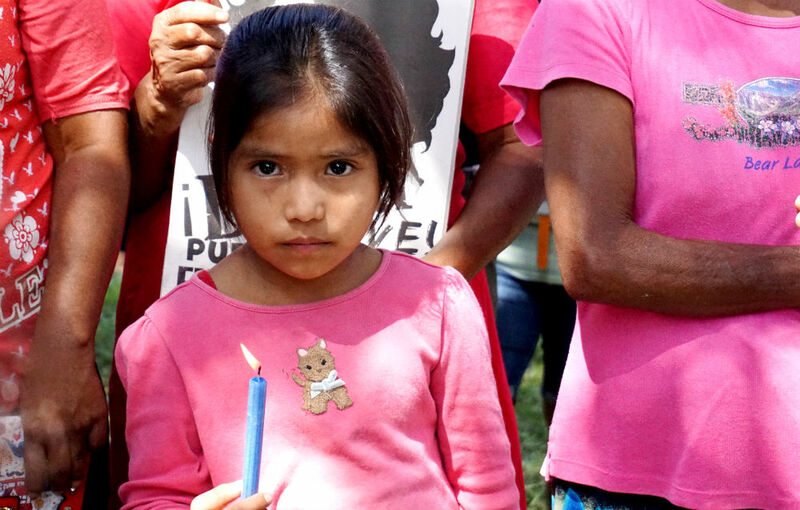 A young Lenca girl pays tribute to Berta Cáceres in Río Blanco. The winding path in the valley behind me is where trees were cleared for the hydro dam on the sacred Gualcarque River. After a short ceremony, we passed around beans and rice from a rusting communal pot on the ground. Then we started the sweaty hike to the Gualcarque River — a path marked by crop fields, abandoned hydro infrastructure, and the graves of those killed in the movement to protect the land and water. 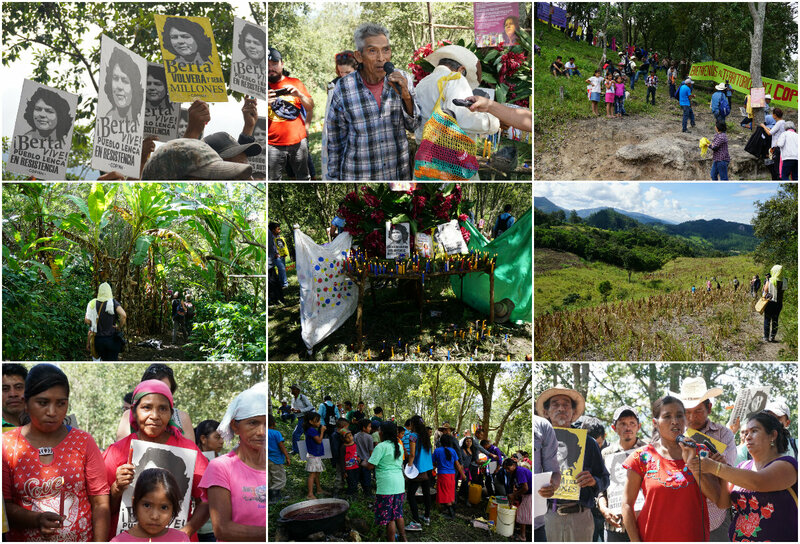 Images from the ceremony commemorating Berta Cáceres in Río Blanco on Oct. 21, 2017. There’s no doubt this could have ended badly. It was a sombre day that ended with a bit of an adrenaline rush. 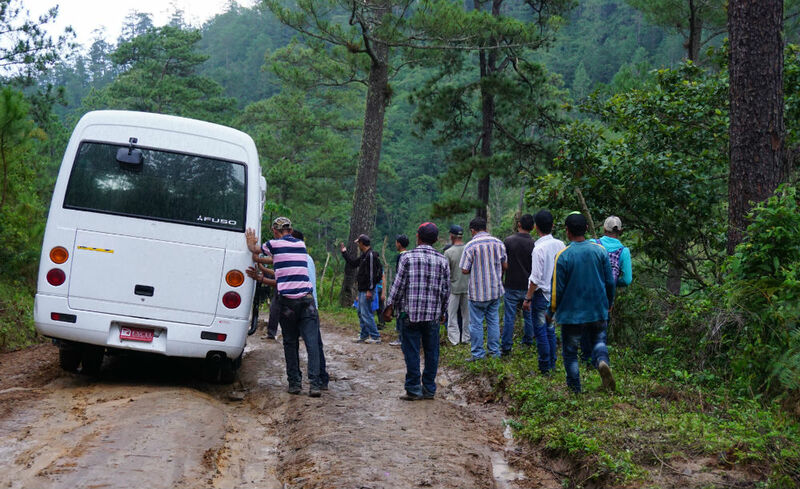 We were sitting in the bus with some Lenca men from out of town, when it started sliding uncontrollably down the slick wet mountain. We hopped out quickly as the bus continued to slip on switchbacks without protective railing. 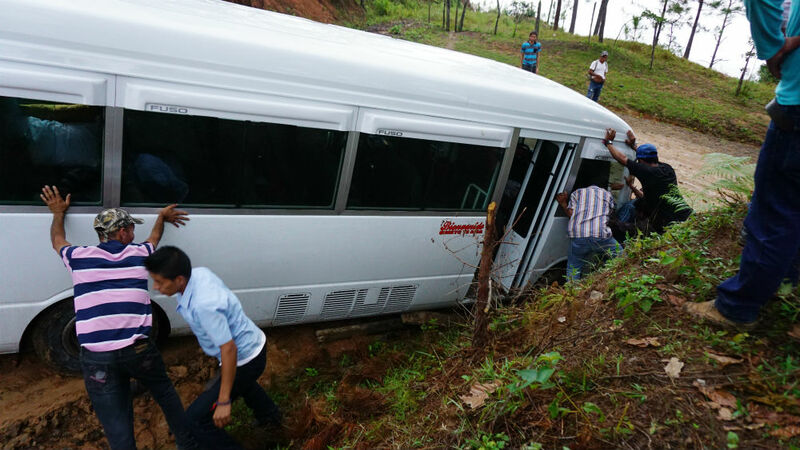 Our guests heaved the bus out of the mud and tried to keep it from teetering over the edge of the cliffs — a feat that nearly cost two or three of them their lives as the vehicle crushed them into a curve. Men on horses jumped out of the way and we walked in the rain until more trucks could come to pick us up. 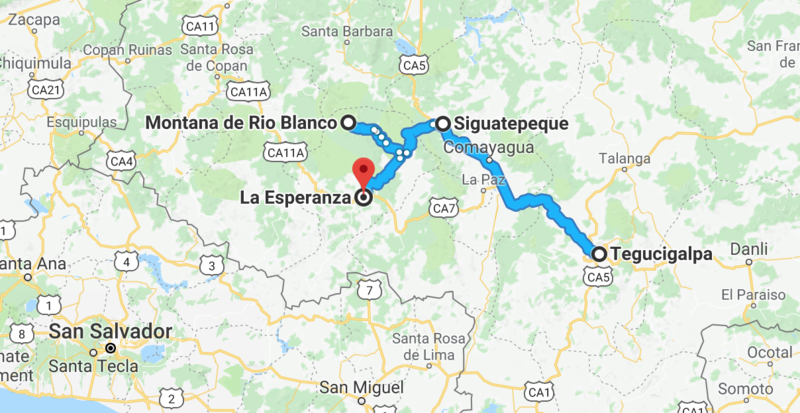 I stayed in this truck, sandwiched between Tawakkol, her husband and her translator, until we reached La Esperanza, the hometown of Berta Cáceres. Her second-youngest daughter, Bertha Zúniga, and her mother were waiting to meet us for dinner at La Hacienda restaurant. It turns out Berta came by her activism honestly — her mother served four terms as the local mayor and ran for congress during the 1980s. It was an unprecedented move for a woman, who was so determined to fight injustice, she sold tortillas on the streets to fund her campaign. Today, Berta’s daughters have taken up the fight, and one was elected to Congress in the recent federal election. I awoke the next morning to the sound of church bells — an unusually cartoonish ring reminiscent of the bus horns in Tegucigalpa. It was Sunday morning, and in the hotel garden, a breakfast of pureed watermelon and pancakes was waiting. A young girl claims victory after a game in La Esperanza’s Parque Central. 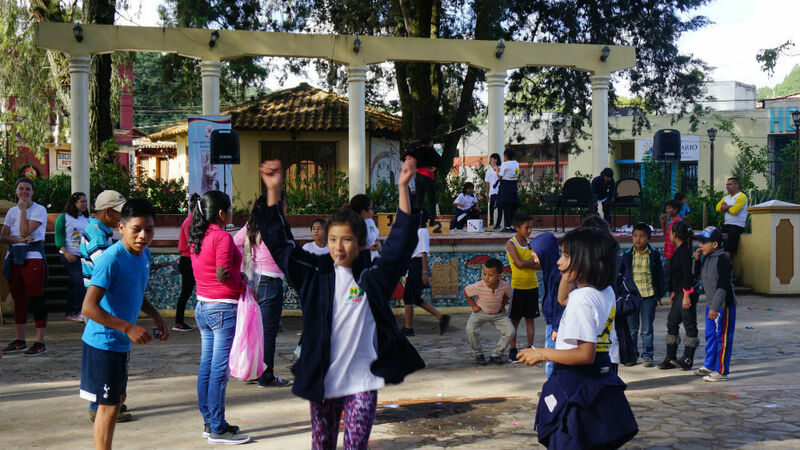 I stepped outside into the Parque Central to a lively scene: children led by local youth groups danced, blew soap bubbles and played ring toss, while elders and families observed the commotion with bits of breakfast in their laps. People fed pigeons by the golden square fountain, and listened to the hymns of the church next door. I absorbed it all happily, chewing on fresh lychee fruit (L 10 for half a bag) as I wandered the markets with Pamela Shifman, executive director of the NoVo Foundation, and a member of our delegation. After an hour or so, we found our way to the northeast end of town, where the picturesque La Gruta lies etched into a hill called La Crucita. The stark white hermitage is dedicated to the Virgin of Immaculate Conception, and was apparently built under orders from J. Inéz Pérez, who hid in the cave to escape his enemies, likely sometime between 1920 and 1944. A view of La Esperanza, the coldest city in Honduras, from the top of La Gruta. 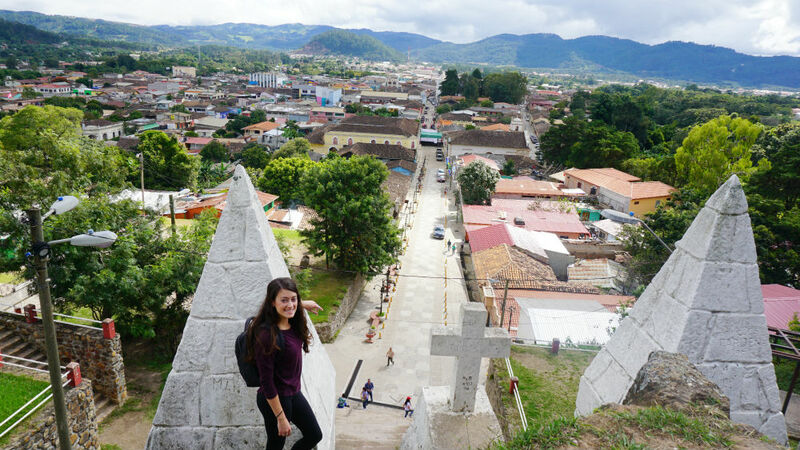 We climbed up the shrine’s steps and behind them to reach the top of the La Crucita, which offers an unparalleled view of La Esperanza and its high-altitude, mountain valley landscape. 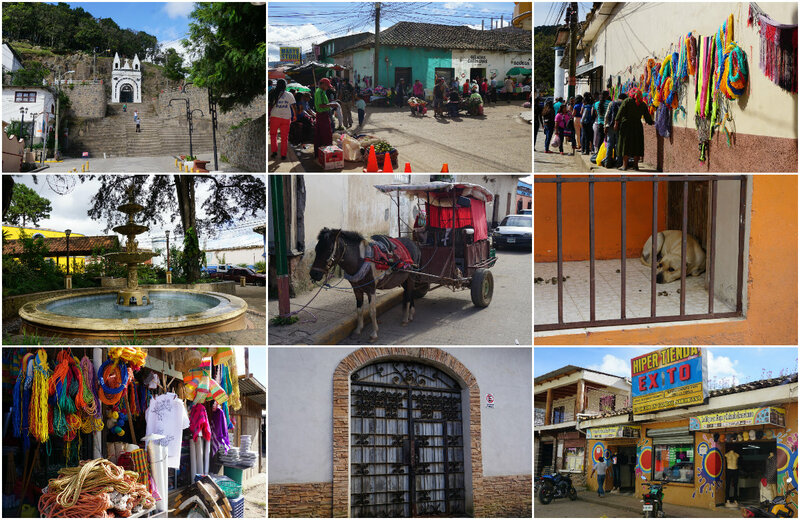 For lack of better adjectives, La Esperanza is a colourful, quaint little city with an extraordinary feeling of warmth — given its renown as the coolest city in the country, that is. When we got back to the hotel, a few girls rushed over to sell us baskets I had seen them quietly obtain from the hotel gift shop earlier that morning. It was a clever tactic indeed — foreigners are more likely to buy from local children than a hotel, and the girls probably got a cut of the sale afterward. Well played. We were seen out of La Esperanza by a rambunctious parade of red and white — the colours of the official opposition Liberal Party of Honduras, which sought to oust to President Juan Orlando Hernández from power. We were in Honduras the month before a federal election, just weeks before its results would hurl the country into its worst political crisis in a decade. Hernández was re-elected against a constitutional ban on presidents serving a second term, and post-election violence has since left more than 30 people dead on the streets. The election put an extra strain on our trip, impacting both the politicians we could speak to, and what our two Nobel laureates could say in public. Neither could be seen to endorse any particular candidate or party, so they focussed their speeches on the promotion of peace, respect for democracy, and adherence to international human rights standards. Nothing can dampen these women’s indefatigable and courageous spirits. By the time we got back to the capital — full of malanga chips from our pit stop in Siguatepeque — we were more than an hour late for our conference with women human rights defenders from across the country. Many were fighting their own battles to protect land and water from mining companies, keep foreign seeds and chemicals away from their crops, and to protect each other in a country where more than 5,000 women and girls have been murdered in the last 15 years. It was, at times, a tearful endeavour. To the right of Suyapa, tributes to missing and murdered women activists, including Berta Cáceres and a number of children, added weight to the evening’s heavy proceedings. More than 7,000 women have been criminally charged in Honduras for their work in human rights advocacy. I awoke on my fourth morning in Tegucigalpa to a wonderful sunny sky, a rare treat at the peak of the rainy season. At this point, I had learned that to ask a server for café con leche, is to receive a small cup with little coffee and mostly milk, so I asked for café con “poquito, poquito” leche as I tucked into the usual: fried eggs, refried beans, a bit of cheese and crema. 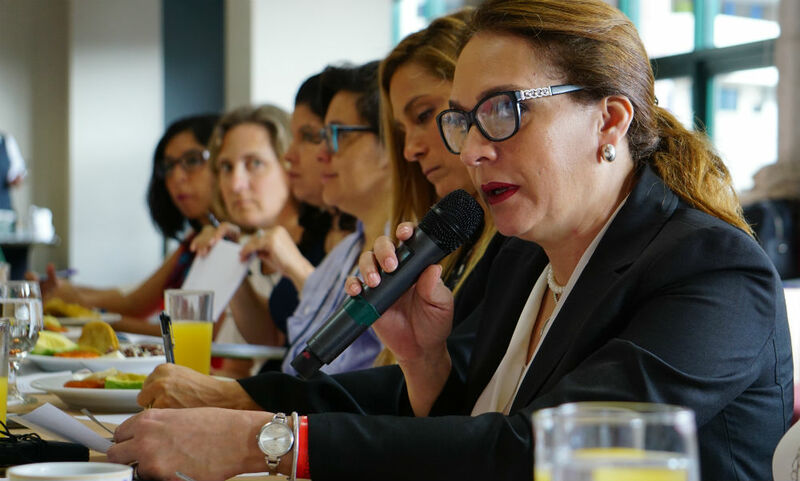 Congressional Gender Equality Commission president Yadira Bendaña speaks about the challenges of bringing gender-based legislation before the Honduran government. I ate lightly, since we had breakfast meeting with Honduras’ Congressional Gender Commission (Women’s Caucus) and Inter-Agency Gender Group. I was thrilled with the prospect of speaking to politicians in a country known for corruption, and hearing their perspective on the human rights crisis they were charged with resolving. I found no quarrel with this group of elected women who, for the first time in Honduran history, were working across party lines to elevate the status of women nationwide. They did not deny that the government had corruption issues, or that women were murdered daily under their watch. But progress is slow and the solutions are complex, they revealed, in a patriarchal culture of machismo — all the rules that govern a society made by men “who consider themselves to be the owners of women’s bodies,” as one woman put it. As female politicians, they faced regular harassment, and even when they managed to put forward a bill in support of human rights, said it was often “bottlenecked” or reversed behind closed doors by their male colleagues in Congress. “Honestly, in many ways we achieved power, but were deceived,” said Yadira Bendaña, president of the commission, naming femicide investigations as an example. It took months of work, she explained, to pass a proposal to create a special investigative unit for femicides after being basically “ambushed at the table” by their male counterparts. In the end, the unit was launched in 2016, but with a paltry budget of $1.5 million. A Lenca woman holds up a candle for slain Indigenous heroine Berta Cáceres. As they discussed the barriers toward progress, I couldn’t help but notice an unsettling juxtaposition. Today, we shared a meal with well-dressed women in lipstick and jewelry, who checked their smartphones in between bites of fruit in a polished hotel boardroom. 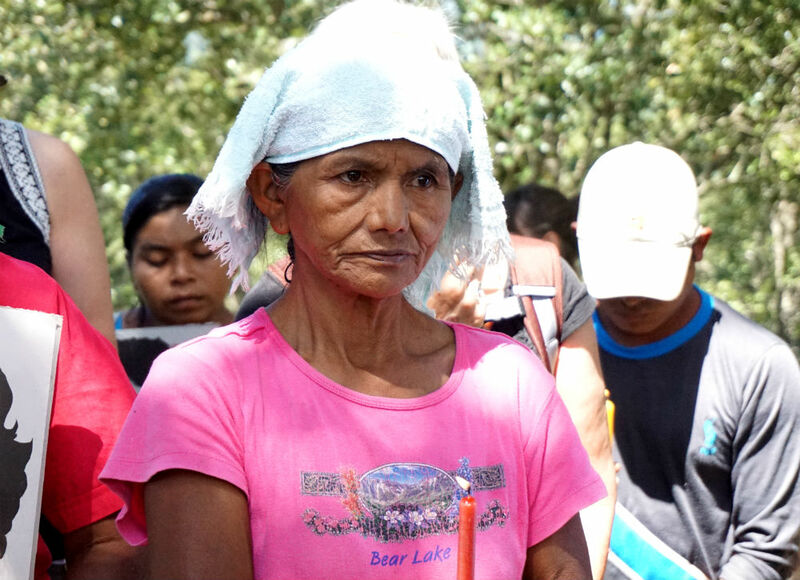 Only days before, we had shared a similar meal with the Lenca women in Río Blanco — many dressed in shabby clothing, and carrying a child in each arm as we ate from a pot on the ground. They settings couldn’t be more disparate, and yet both these groups of women worked toward a common cause: respect for the rights of women and girls. It was a meeting-heavy day. That afternoon, we chatted with the special representative of the Secretary General of MACCIH, the Mission to Support Corruption and Impunity in Honduras. It’s described as a relatively “toothless” body, whose investigative work is being actively hampered by the government. While they spoke vigorously about the problems and need for change in Honduras, it seemed to me that they hampered their own work as well — during our meeting, one of MACCIH’s high-ranking members fell asleep. Our last meeting was with members of the G16 and the representative of the United Nations High Commissioner for Refugees, who pursued various diplomatic options to reduce corruption and impunity in Honduras. 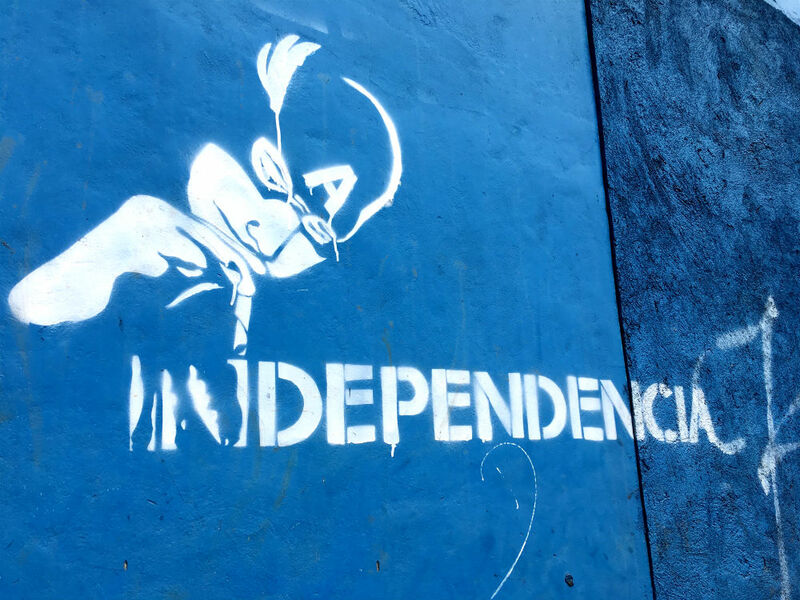 The was a discernible air of frustration in the room — forced to weave through complex bureaucratic hoops with a government that has not been fully co-operative, they revealed that international community has placed its hope for Honduras in MACCIH. 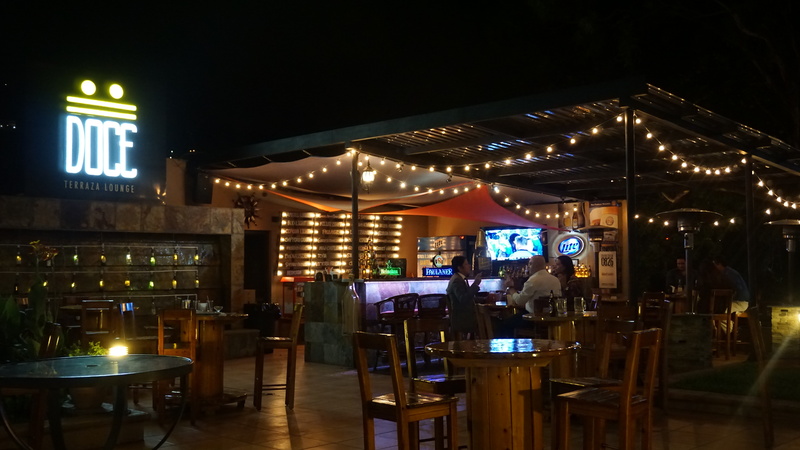 Drinks and appetizers at the Bar Doce Terraza Lounge in Tegucigalpa. That evening, we attended a pleasant but uneventful diplomatic reception hosted by the Embassy of Canada, then returned to the hotel for a small celebration on our final night in Honduras. 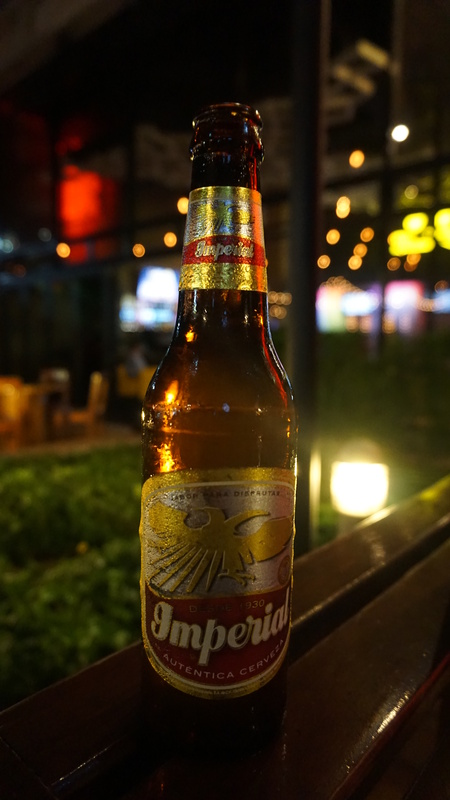 We gorged on anafre, catracha sushi (catracha/o is a non-offensive word for Hondurans) and the country’s Imperial beer, which I found unimpressive. We discussed all of our mission’s findings to date, and decided that someone needs to invent a smartphone app that generates witty comebacks for sexist comments from men. Our last day in Honduras was bittersweet. We said goodbye to new friends and allies who worked tirelessly during our stay to ensure all went smoothly, with the knowledge that our journey would continue in Guatemala and the numbers in our delegation would grow. Sandra Maribel Sánchez is the second woman in Honduran history to be assigned to cover the National Congress. Our Nobel laureates, Shirin Ebadi and Tawakkol Karman, held a press conference for Honduran journalists. Some tried to corner them into commenting on the national election, but they coolly directed their answers toward the right of Honduran people to justice, safety and equal opportunity. 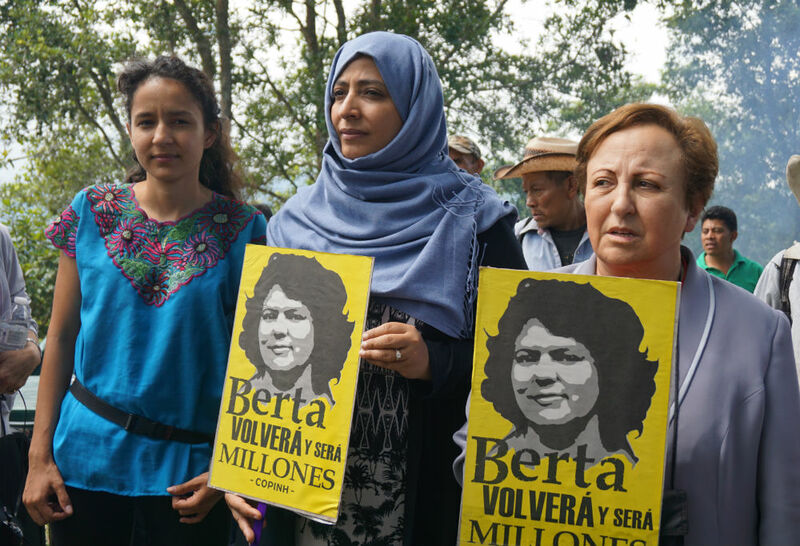 Bertha Zúniga, the second-youngest of Berta Cáceres, joins Nobel Peace Prize laureates Tawakkol Karman and Shirin Ebadi on Lenca territory in Río Blanco. Outside the room where this took place, I met a charming elderly woman named Katia Cooper, who — upon hearing I’m Canadian — begged me to deliver her best wishes to celebrated Canadian filmmaker, climate activist and author Naomi Klein. She was a big fan of The Shock Doctrine, she explained, and regarded Naomi as personal heroine. Katia said she only wished the book was less expensive, so it could be stocked in Honduran classrooms. I sent an email to Naomi on her behalf. We left that afternoon for Guatemala City. It didn’t go as smoothly as we had hoped — one of our delegation member’s bags were searched due to “suspicious” contents (paper pamphlets for a non-profit) and Shirin was held back by customs of her Iranian passport. I left Honduras feeling troubled. Corruption, injustice and crime certainly don’t shock, but I admit to being surprised by the boldness of its form in Honduras. In other countries I’ve worked in, efforts are at least made to mask and deny corruption, but here, it was widely acknowledged by elected officials. It seemed as though the people were actively dared to challenge it, and crushed for rising to the occasion. Nobel Peace Prize laureates (centre) Shirin Ebadi (left, centre) of Iran and Tawakkol Karman of Yemen, show their support for women human rights defenders in Honduras at a conference in Tegucigalpa on Oct. 22, 2017. Don’t walk around with anything that makes you a target in Tegucigalpa, including phones, cameras or purses. It’s best not to walk alone either, especially if you’re a woman. Bring American currency with you, and swap it for Lempiras at your hotel. If you can withdraw at an ATM in the city, even better, since you’ll probably get a better rate. Just make sure you have local currency on hand if you travel into rural areas, where you’re unlikely to find a bank machine. 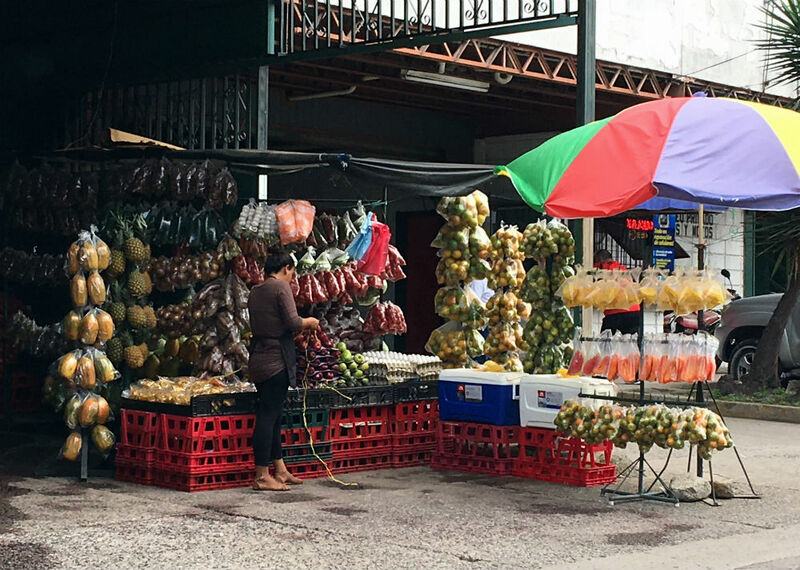 There isn’t much English spoken in Honduras, even in the capital. A little Spanish goes a long way, so have a few phrases ready in advance. 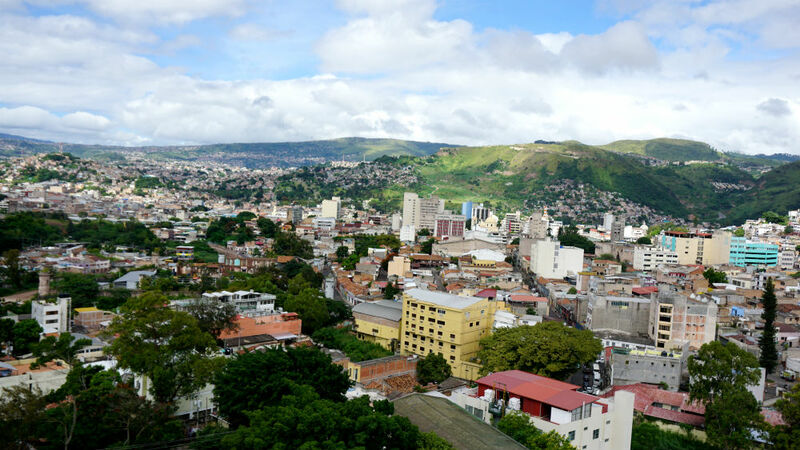 Prepare to encounter brutal traffic in Tegucigalpa, and factor it into the amount of time you give yourself to get anywhere, including the airport. 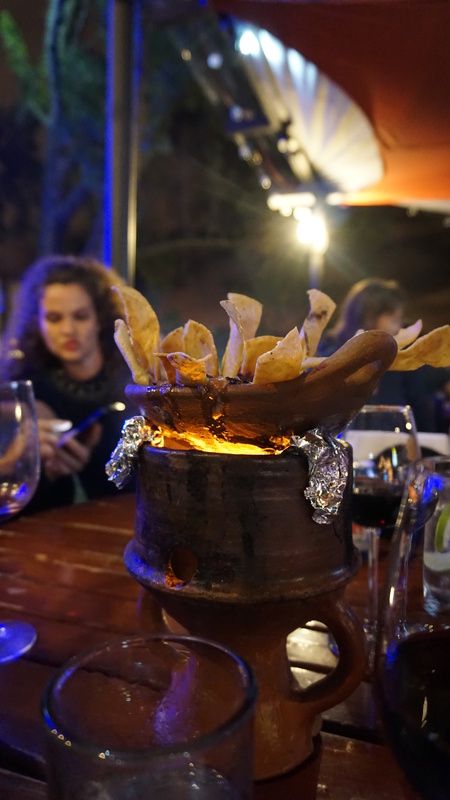 For delicious food and an unparalleled view of downtown Tegucigalpa, check out Piso 24 in the Torre Metropolis, and ask to sit on the terrace. Print plans and make reservations ahead of time, since foreigners aren’t allowed to purchase local SIM cards, and you may not be able to make use of you cell phone without a pricey international plan. 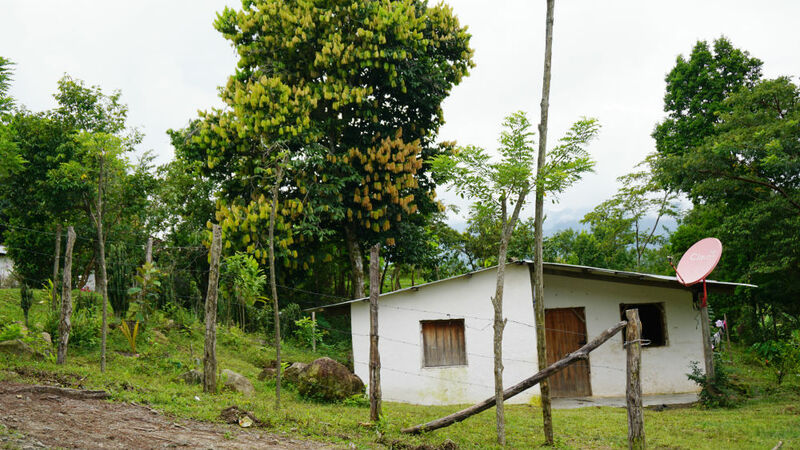 Make sure you’re up to speed on what the presence of malaria and Zika virus in rural Honduras. I didn’t visit Honduras as a tourist, and recommend scrolling through Wikitravel for a list of the country’s highlights, including Mayan ruins at Copán, scuba diving in Utila and Roatán, and more. The Hotel Honduras Maya is a well-furnished hotel in a safe part of Tegucigalpa. You may want to consider forking out the base rate of USD 90 per night for peace of mind and comfort in a city where it may not be wise to gamble on the cheapest hostel. The Honduras Maya has a swimming pool, WiFi (spotty, at best) and above average restaurants and bars. Get in touch at +504 2280 5000 or info@hondurasmaya.hn. Reputable hostels in Tegucigalpa include Palmira Hostel, La Ronda Hostel Tegucigalpa and Hostal Mision Catracha. Posada Papá Chepe is a clean, affordable hotel in La Esperanza with rates as low as USD 50 per night, inclusive of breakfast. 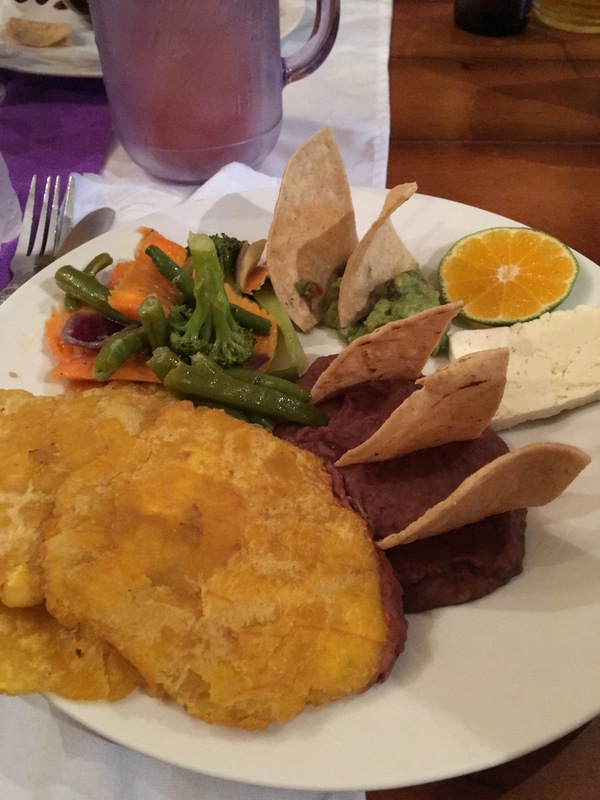 The WiFi is pretty decent and it’s within walking distance to all of La Esperanza’s major attractions. Call +504 2783 0443 for a reservation.